Learn how to craft delicious and healthful drinks with fresh and wild fruit, flowers, and herbs. 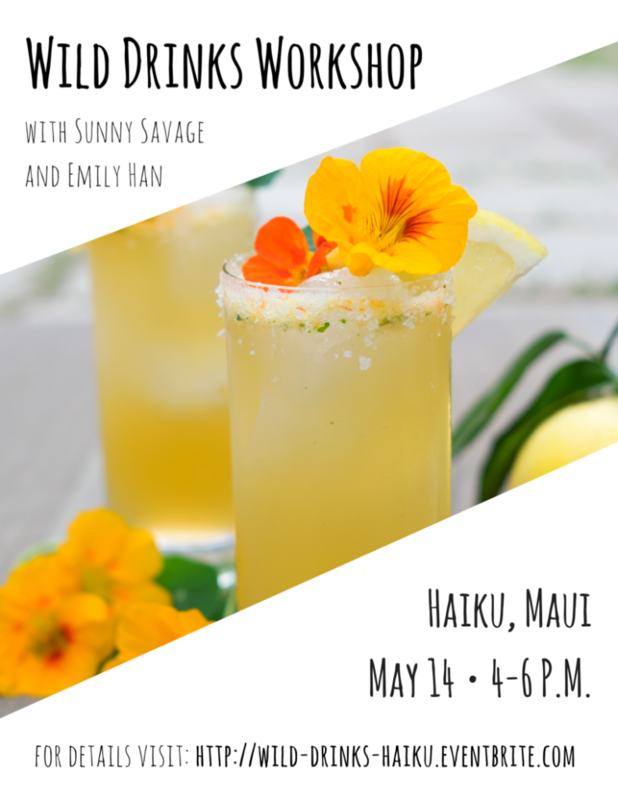 In this workshop and tasting hosted by Sunny Savage, author of Wild Food Plants of Hawai’i, and Emily Han, author of Wild Drinks and Cocktails, you’ll discover the techniques and confidence to make your own creative cocktails and mocktails. We’ll introduce you to some wild and seasonal ingredients of Maui, teach you how to incorporate them into drinks, and how to make syrups and infusions. Then you’ll roll up your sleeves as we set you loose to mix, muddle, and garnish your own signature mocktail (with tips for adding alcohol later, if you wish). You’ll be the star of every gathering after this class! Sunny and Emily will also have wild foods and books for sale. Get your copy signed! Note: This workshop will take place at a private residence (with the best ocean view in all of Haiku!). Registered participants will receive an email with directions. There will be a live DJ and a party to follow. Sunny Savage (http://www.sunnysavage.com/) is a wild foodie and adventurer who has been passionate about incorporating wild food plants into the modern-day diet for nearly two decades. Her internationally televised program Hot on the Trail, TedxMaui talk, and recently published book Wild Food Plants of Hawai’i have provided a platform for local food systems and social justice activism on Maui. Emily Han (http://emilyhan.com/) is a writer, recipe developer, educator, and herbalist based in Los Angeles. Passionate about helping people cultivate a mindful relationship with nature and nourishment, she is the author of Wild Drinks and Cocktails, founder of LA Food Swap, and Communications Director for LearningHerbs.com.